California allows non-lawyers to offer legal assistance to individuals, provided they get licensed and post a surety bond as part of the process. The bond acts as protection for the clients of legal document assistants, and ensures that legal assistants comply with the provisions set out in Division 3, Chapter 5.5 of the California Business and Professions Code. The legal document assistant must represent the client’s best interest, or face a claim which will act as compensation to the affected party. To learn more details about this bond, read on through the Q&A section below. If you prefer to talk to one of our agents directly, you can call us at (877)-514-5146.
Who is required to obtain a legal document assistant bond? What’s the cost of a legal document assistant bond? Can I obtain this bond with bad credit? How do I apply for this type of bond? What are the requirements for becoming a legal document assistant in California? The penal sum of this bond is $25,000, which means a claimant can get up to $25,000 in compensation if they have been defrauded by their legal document assistant. The sum that legal document assistants pay, however, is just a biannual premium. Premiums vary between 0.75% and 3% of the bond amount for applicants with a good credit score and no issues in their credit report. This means the two-year cost can be as little as $500, and in some cases even less. Consult the table below for more detailed information. 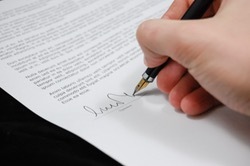 For more information you can visit our “What Does a Surety Bond Cost?” page. Yes! Getting bonded is still possible even you have bad credit. Typically, bad credit is considered anything below a FICO of 650, but applicants with no credit history are also considered high-risk. High-risk applicants typically pay a higher premium (up to 10%) so as to compensate the risk involved for the surety provider. Often, however, bonding companies may want to consider additional information along with your credit score, such as other items in your credit report, your financial standing and even your industry experience. These can affect your premiums negatively or positively. Rest assured that our surety agents will help you build a strong application so that you will receive the lowest possible premium for your particular situation. Learn more about getting bonded with bad credit on our dedicated page. The application process is simple and straightforward. Start by filling out our online application. It takes just a few minutes to complete and requires you to submit some basic information about your business. If you submit ownership information, you can save even more time and get a more precise quote. Son after receiving your application, we’ll contact you via phone or email (whichever you prefer) to give you a free quote and help you with the rest of the application process. Usually, we can deliver your bond within two business days. Posting a surety bond is just one of the important requirements that applicants must fulfill if they want to get registered as legal document assistants. You must also satisfy educational requirements (available in Section 6402.1), fill out the application form in full, and pay $175 in fees for each county you want to operate in. Keep in mind that this is an individual license, so if you have partners, all of them must complete the application process as well. Licenses must be renewed every two years, which includes the renewal of your legal document assistant bond.